Home MTAANI NEWS Ofafa, Starehe residents to get alternative relocation – DP Ruto. Ofafa, Starehe residents to get alternative relocation – DP Ruto. The government will assist the Kiambu County Government to permanently resolve the housing problem in Thika Town Constituency through funding a project to seek alternative housing for the JAMOFASTA residents. This was revealed by His Excellency the Deputy President William Samoei Ruto during his visit to the town on Sunday. Speaking at the Stadium roundabout, Ruto instructed Kiambu Governor Ferdinand Waititu ‘Baba Yao’ to secure some land where the tenants can be relocated as the government funds their housing project. “Your governor Baba Yao has notified me of the housing crisis that has bedeviled tenants of JAMOFASTA for the last few years. I have instructed him to buy a piece of land where we will build houses for them for relocation,” said the deputy president. JAMOFASTA is an umbrella for tenants living in the county houses of Jamuhuri (TODC), Starehe and Ofafa Estates. These residents have been entangled in legal battles with the former regime over rent payments for the last four years. On national politics, the deputy president accused the Supreme Court of orchestrating a civilian coup against the people of Kenya by annulling the re-election of President Uhuru Kenyatta arguing that no one ever disputed the vote. “The Supreme Court has orchestrated a civilian coup against the people of Kenya. They shall be condemned to shame when the people of Kenya will demonstrate who is supreme. 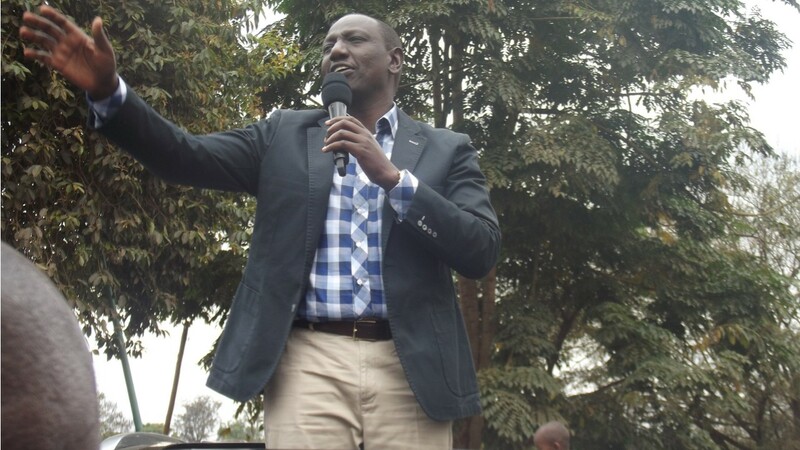 You cannot tell us that the decision of the 15 million voters who woke up very early on the 8th of August to cast their votes that this doesn’t count and what really counts is the decision of some four people who want to plunge this country into a constitutional crisis,” said an angry Ruto. Ruto warned that the president and himself will not be blackmailed or intimidated through the courts using power brokers who want to get into government through the backdoor. “History is repeating itself. In 2013 the same people took us to the ICC with a view of blocking us from leading the country. In 2017, they have done it with the Supreme Court. Wembe ni ule ule! We will beat them again. Uhuru Kenyatta will make history as being the first person to be elected three times within five years,” he said. Elgeyo/Marakwet Senator Kipchumba Murkomen described the court ruling as political saying that it abused its courtesy by ruling against the will of natural justice. Tharaka-Nithi Senator Kithure Kindiki questioned why the judges failed to order a recount if the only problem with the elections was with its transmission. Speaking at the ACK Cathedral, Gov. Waititu promised to rid hawkers of the town streets within the near future and relocate them to a designated place where they will trade their wares without interfering with the normal day-to-day life of the residents. Others who expressed their disappointment with last Friday’s Supreme Court ruling included Cabinet Secretary Ministry of Water and Irrigation Eugene Ludovic Wamalwa, Senate Speaker Kenneth Makelo Lusaka, Gatundu South MP Moses Kuria, Alice Muthoni Wahome (Kandara), Francis Munya Waititu (Juja) among others.